Geospatial data in the Knowledge Graph is awesome. Let’s dive in! Stardog’s geospatial index is a powerful tool. Many users have augmented their knowledge graphs with spatial data to great success, adding another layer of utility to the enterprise. However, it is often one of the more troublesome features, having the potential to cause a few headaches when getting started. In this post, I intend to provide a detailed primer to help alleviate those headaches. 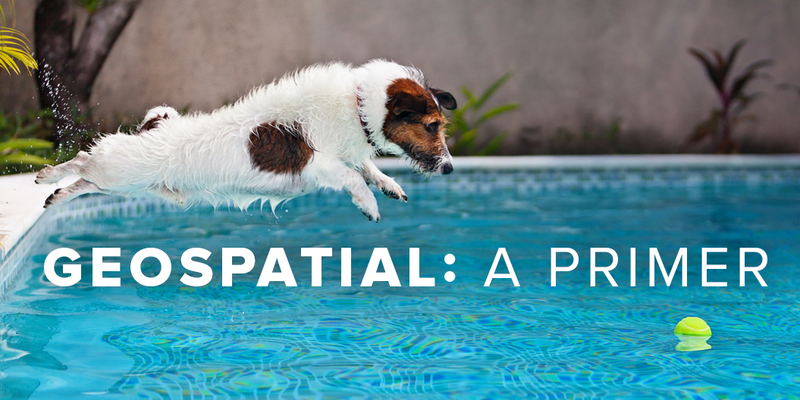 Stardog supports two geospatial specs: W3C’s WGS 84 and OGC’s GeoSPARQL. 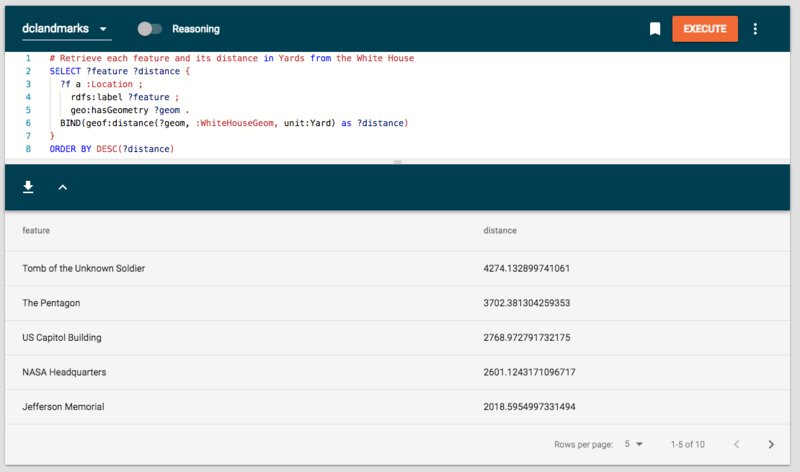 In this post I will, for the sake of clarity and readability, combine the two by using GeoSPARQL’s hasGeometry predicate to map locations and areas to all to all nodes of type geo:Geometry. While this is technically unneeded for WGS 84 features, it makes the queries we will be running on the data much easier to follow. 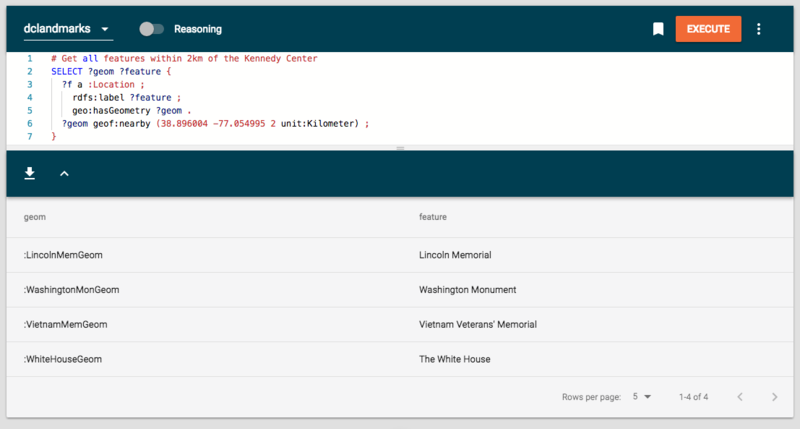 We will be using a DC Landmarks data set. Feel free to load it yourself and play along! It is worth noting that geospatial features are not enabled in the Community version of Stardog. You must have an Enterprise license, or trial thereof, to enable spatial. By default, the spatial index is not enabled when creating a new database. It can be enabled by setting the spatial.enabled=true option when creating the database via CLI, or setting GeospatialOptions#SPATIAL_ENABLED to true in the SNARL API. Our toy data set has about 10 nodes representing various landmarks in the Washington, DC area. Besides any domain knowledge we wish to attach to these nodes, in order to perform any spatial operations on them we need to associate them with a Geometry entity. Our second option is to define our point’s Geometry using the OGC’s Well-Known Text (WKT) format. While it’s a fair bit easier to make mistakes this way, representing points with WKT will be more congruous with the rest of our data set, not to mention others’ data sets, as WKT is very widely used. # as (LONG LAT), with no comma! Especially note the somewhat odd ordering of (min, max, max, min). Now that we have inserted Geometries into Stardog’s spatial index, it would be nice to query them spatially. 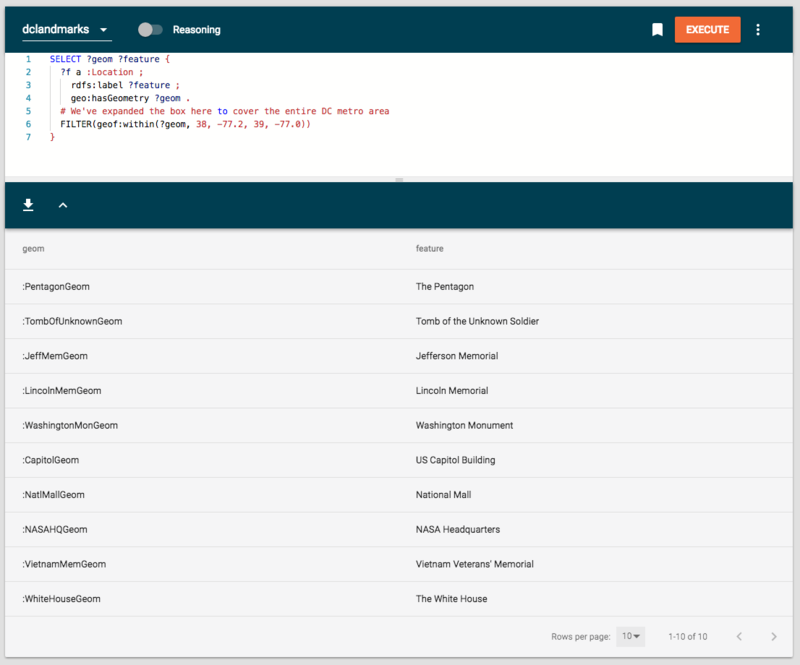 Stardog supports five of the major operators defined by GeoSPARQL. These functions require units of measurement to be passed; we support the QUDT ontology for this, prefixed in our dataset by unit:. ?geom geof:within "ENVELOPE(-77.111, -77.052, 38.885, 38.855)"^^geo:wktLiteral . ?geom geof:within ("POINT(-77.111 38.855)"^^geo:wktLiteral "POINT(-77.052 38.885)"^^geo:wktLiteral) . We can also use geof:within as a filter by passing in our Geometry as the first argument and then using any of the accepted sets of paramters. This returns the area of a given Geometry in the specified unit. 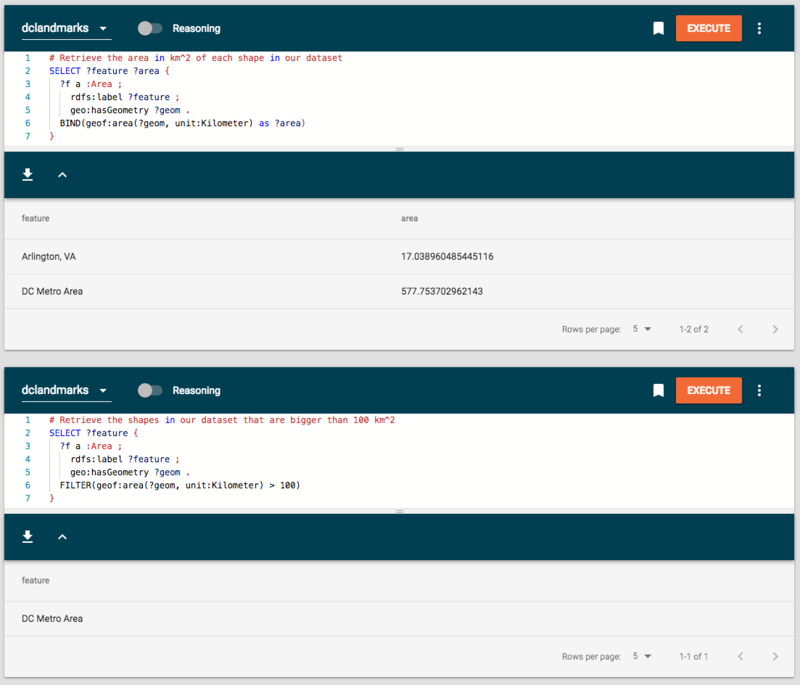 It can be used either to bind a variable or as part of a filter. This returns the distance between two Geometries in the specified unit. It can also be used as a variable binding or as a filter. This returns the relationship between two Geometries. Possible results are geo:contains, geo:within, geo:intersects, geo:equals, geo:disjoint. ?rel geof:relate (?geom1 ?geom2) . Geospatial processing is a very powerful tool and an excellent enhancement to an enterprise knowledge graph. Hopefully this blog post can help to ease some of the headaches that can come along with navigating the specs and getting this information properly into the Stardog spatial index.